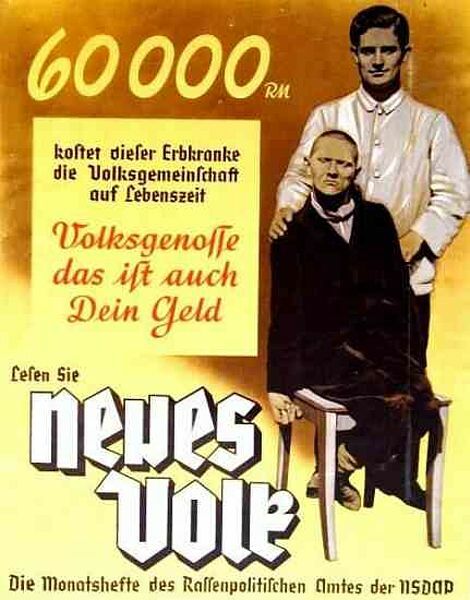 The period of National Socialism was the darkest hour in German psychiatry: at least 250,000 mentally ill and disabled people became victims of the so-called “euthanasia” programme. Psychiatrists played a decisive role in the forced sterilisation of up to 400,000 mostly mentally ill and mentally disabled people. Jewish and politically undesirable psychiatrists were persecuted and driven out of Germany. How could it happen? 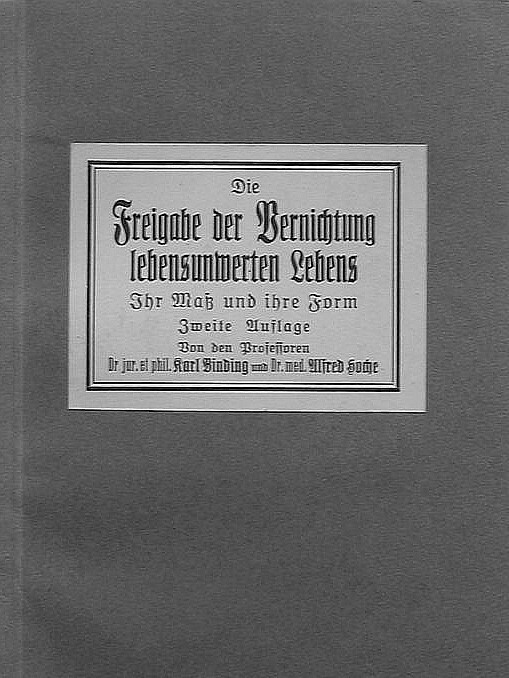 The following was recorded in the minutes at the beginning of the meeting of the German Association of Municipalities conference of asylum heads on 11 December 1931, for example: “In view of the drastic changes in all areas of daily life, in particular with regard to the cutbacks in the school system and youth welfare services and the reduced standard of living for families with healthy genetic material through unemployment and salary and wage cutbacks, the question must be raised as to what extent one can take responsibility for the use of public funds to support ill people and strongly endangered genetic material”. This economic argument was to play a decisive role in the “euthanasia” programme of the National Socialists. The National Socialists’ “Law for the Prevention of Hereditarily Diseased Progeny” from 14 July 1933 referred to a Prussian draft bill from the Weimar period. However, besides the economic motives the compulsive character of the law and the radicalism of its implementation revealed the “racial policy” dimension that the new holders of power were thereby pursuing. People with schizophrenia, manic-depressive disorders, genetic forms of epilepsy, Huntington’s chorea, blindness, deafness, severe physical deformity or alcoholism could be sterilised against their will. The decision about sterilisation was made by “Hereditary Health Courts” or, in case of an appeal, by the “Hereditary Health Courts of Appeal”. Both types of court were newly formed for this purpose and their members were chosen on the basis of their ideological proximity to the regime. A requirement for sterilisation was submission of an application by the person themselves, their legal representative, an asylum head or a public health officer. Up to 400,000 people were sterilised on the basis of this law. From 1939 on, the Central Office II (headed by Viktor Brack) of the „Führer’s chancellery“ (under Reichsleiter Philipp Bouhler) started planning the euphemistically named „euthanasia“ programme to kill patients in sanatoriums and mental asylums. Hitler’s personal doctor, Dr. Karl Brandt, was appointed as the medical „euthanasia representative“. The Würzburg psychiatrist and neurologist Prof. Werner Heyde took over the medical leadership of the killing programme; Prof. Hermann Paul Nitsche, Director of the Sanatorium and Mental Asylum Sonnenstein near Pirna, was appointed as his deputy. The killing was „legalised“ through a „letter of authorisation“ written by Hitler in October 1939 but backdated to 1 September 1939, the first day of the war. Registration forms were sent from the Berlin Chancellery (which from April 1940 onwards was located in a villa at Tiergartenstrasse 4, hence the abbreviation „T4“) to sanatoriums and mental asylums in the German Reich and the annexed territories. The registration forms were completed by the psychiatrists in charge of treating patients on site and then evaluated by about 40 doctors appointed by the head office. These doctors decided about life and death without having personally seen the patients. A red plus sign was placed on the registration forms of more than 70,000 patients, indicating that they had been selected to be killed. The patients were collected from the asylums by the „grey buses“ that became a symbol of the „euthanasia“ programme and between January 1940 and August 1941, after a brief stay in intermediate facilities, the patients were asphyxiated by gas at one of the six killing centres Grafeneck, Brandenburg, Hartheim, Pirna-Sonnenstein, Bernburg and Hadamar. At least 5,000 physically and mentally ill children and adolescents were also killed in about 30 „specialist paediatric departments“. The killings were not limited to the area of the German Reich. In autumn 1939, for example, SS and Einsatzgruppen (special SS units) killed patients in psychiatric hospitals in occupied Poland. After protests by relatives and the Catholic church – Bishop Graf von Galen’s sermon on this topic given in Münster on 3 August 1941 became famous in this context – the „euthanasia“ programme was officially stopped in August 1941. However, the suffering and dying of patients was by no means over. Until the end of the war thousands of patients in nursing homes and psychiatric institutions were starved or killed by drugs. To make room for reserve and replacement hospitals for air-raid victims, starting in 1943 the regime transferred patients from sanatoriums and mental asylums to regions at risk for bombing („Aktion Brandt“). At the receiving institutions, the patients were killed with phenobarbital or through targeted neglect (starvation diet). People were no longer selected by the „T4 evaluators“ but by the doctors and asylum heads on site. The most infamous killing centres of this „decentralised euthanasia“ were „Am Steinhof“ in Vienna, Eglfing-Haar, Eichberg, Grossschweidnitz, Hadamar, Irsee bei Kaufbeuren, Meseritz-Obrawalde and Tiegenhof. A total of 250,000 to 300,000 people fell victim to the „euthanasia“ programme. 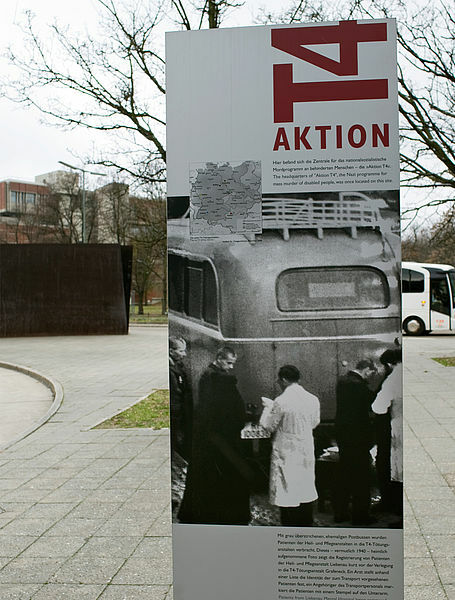 The staff appointed to perform the killing at the „euthanasia centres“ and the responsible department of the „Führer’s Chancellery“ continued to put themselves at the service of the murderous Nazi racial policies: under the codename „Aktion 14 f 13“ they made selections in Himmler’s SS imperium – the concentration camps – to single out thousands of ill people and also Jewish people and other prisoners who had fallen into disrepute and kill them in the killing institutions Bernburg, Hartheim and Sonnenstein-Pirna. These staff also formed the core group at the „Aktion Reinhardt“ extermination camp on Polish soil, where the genocide against European Jews took place in 1942/43. In the Nuremberg doctors’ trial, which lasted from 9 December 1946 until 20 August 1947 and was the first of twelve Nuremberg trials, Karl Brandt, Hitler’s medical „euthanasia“ administrator, and Viktor Brack, the organiser in the „„Führer’s Chancellery“, were held to account for their crimes. Both were sentenced to death and hanged in Landsberg am Lech on 2 June 1948. However, many doctors and staff involved in the killing of ill people were not brought to justice or were punished comparatively mildly. From the beginning psychiatrists placed themselves in the service of NS policy: the director of the German Psychiatric Research Institution, Ernst Rüdin, co-authored the „Law for the Prevention of Hereditarily Diseased Progeny“ in July 1933; doctors registered „genetically defective people“ with the authorities for sterilisation; Prof. Werner Heyde oversaw the „Aktion T4“; psychiatrists completed the registration forms sent out from the Berlin Chancellery – knowing full well what the consequences for their patients were –; medical experiments were conducted; Jewish colleagues were excluded from the professional associations; and, after the end of the war, the crimes were denied and belittled. Without the initiative and support of psychiatrists and other doctors, the national socialist „euthanasia“ programme could not have been implemented.